Visa Rules Update 15th September 2014, this info is up to date. Thai Immigration has limited entries on visa exemption stamps. Real Tourist arriving via an international airport will still obtain a 30 day stay, however travelers using OUT/IN method to extend stay will be denied entry. Decision is at the discretion of the Officer. Holders of valid Tourist Visa will be granted a 60 day stay and a valid Non Immigrant Visa allow 90 day stay, no changes if you hold valid visa. 1. Tourist Visa Waiver (visa exemption), no visa is required prior to commencing travel to Thailand. Countries which get 90 days: Brazil, Chile, Peru, South Korea (not possible to enter via any Land border), Argentina. Countries which get 30 days: Canada, France, Germany, Hong Kong, Italy, Japan, Laos, Macau, Mongolia, Russia, USA, United Kingdom and Vietnam.THESE COUNTRIES CAN ENTER VIA AIRPORT AND CAN EXTEND FOR 30 DAYS AT THAI IMMIGRATION, THAN THEY ARE ALLOWED ONE 30 DAY STAMP FROM LAND BORDER WHICH CAN BE EXTENDED AGAIN FOR 30 DAYS AT THAI IMMIGRATION. AFTER THAT THEY HAVE TO APPLY FOR A VISA AT ROYAL THAI EMBASSY VIENTIANE/LAOS. Laotian special, please check with us. Countries which get 30 days at Airport and ONE 15 day stamp upon entry at land border: Australia, Austria, Bahrain, Brunei, Belgium, Czech, Denmark, Finland, Greece, Hungary, Iceland, Indonesia, Ireland, Israel, Kuwait, Liechtenstein, Luxembourg, Malaysia, Monaco, Netherlands, Norway, New Zealand, Oman, Philippines, Poland, Portugal, Qatar, Slovak, Slovenia, Singapore, South Africa, Spain, Sweden, Switzerland, Turkey and UAE. THESE COUNTRIES CAN ENTER VIA AIRPORT AND CAN EXTEND FOR 30 DAYS AT THAI IMMIGRATION, THAN THEY ARE ALLOWED ONE 15 DAY STAMP FROM LAND BORDER WHICH CAN BE EXTENDED AGAIN FOR 30 DAYS AT THAI IMMIGRATION. AFTER THAT THEY HAVE TO APPLY FOR A VISA AT ROYAL THAI EMBASSY VIENTIANE/LAOS. 2. Countries which get Visa on Arrival at certain ports of entry in Thailand, however it is NOT possible to obtain a Visa on Arrival to enter Thailand at any Thai/Cambodian Checkpoints: Andorra, Bhutan, Bulgaria, China, Cyprus, Estonia, India, Kazakhstan, Latvia, Lithuania, Maldives, Malta, Mauritius, Romania, San Marino, Saudi Arabia, Taiwan, Ukraine, Uzbekistan. 3. Other country’s passport holders must obtain a Visa at a Thai diplomatic post abroad prior to commencing travel to Thailand. General info and things to consider: We strongly recommend you to copy or record with your camera, upon entry into Thailand, following pages and keep the copies separate: Passport, latest Visa, latest Entry stamp and latest TM Card (Embarkation Card). Apply for visa extensions at the Immigration Office in Soi 7 off Chaeng Watana Road from Monday to Friday, http://bangkok.immigration.go.th/en/location1.html or at your local Immigration Office. Re-entry permits are available at Suvarnabhumi International Airport and Don Muang International Airmort, departure hall. After check in and security, but before you reach Thai Immigration departure desk. A 60day “Tourist Visa” and since 29th August 2014 also the 30/15 days visa exempt stamp will be extended for 30-days, cost THB 1,900.-. 5. Copy of corporate documents, namely; – company registration certificate – list of company shareholders – memorandum of company’s regulation – latest income tax statement – latest registration of value added tax. 7. Copy of the recent police clearance or certificate of no criminal conviction. 8. Copy of the previous/current work permit (if any). In the event that you hold a Non-Immigrant Visa Type “B” with work permit and you resign before the expiration date, you must immediately cancel the visa at Thai Immigration. It is not necessary to return the Work Permit anymore, however the company must issue a letter confirming the last day of employment. 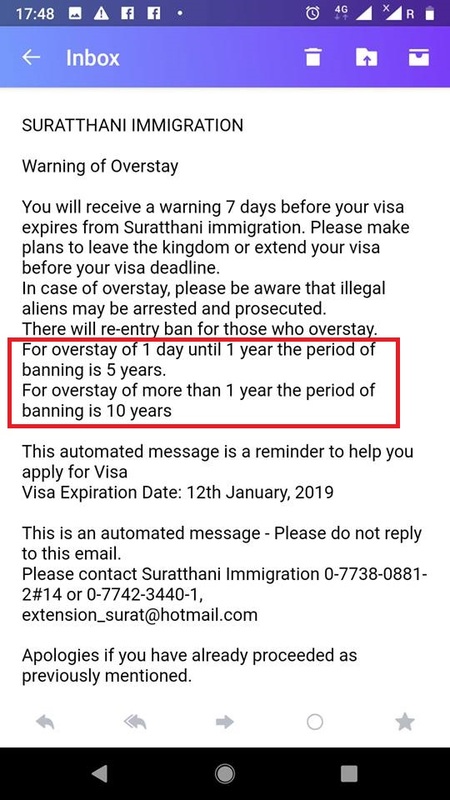 There is no “7-day grace period” anymore , however Thai Immigration will offer you a 7 day extension of stay but you have to pay THB 1,900.-. Some border checkpoints will not allow you to leave Thailand without a canceled visa stamp in your passport! Ban Laem and Nong Khai are two of them. Overstay charges are THB 500.-/day – up to a maximum fine of THB 20,000.-. Overstay is a serious offence and following regulation might come, within 1-2 month, into effect, NO Official date has yet been announced.